Based on reviews from 232,897 users. 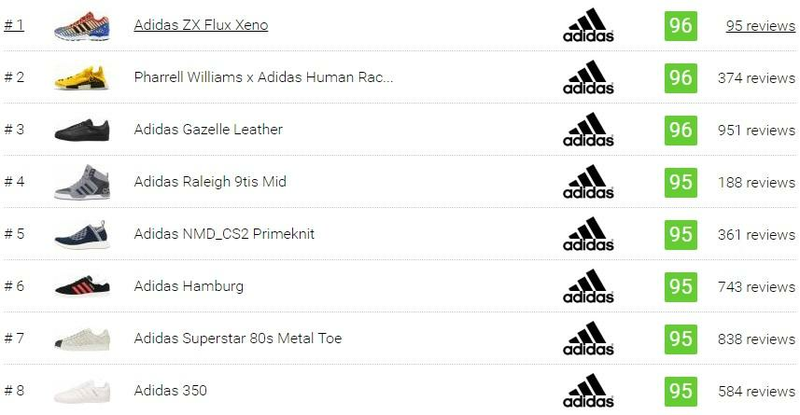 Learn how our rankings work or see our guide to Adidas sneakers. Updated Apr 2019. With its prominent presence in the fashion and sports scenes, it is no doubt that Adidas is one of the most iconic and highly sought-after footwear brands today. Its signature Three Stripes may be as ubiquitous as other athletic footwear brands such as Nike, Reebok, Puma, or New Balance among many others, but it stands out for its rich history and influence in sports, music industry, sneaker culture and its subcultures. Adidas, like its competitors, started as an athletic shoe brand. Throughout the years, it gradually transitioned to widening its product range from just athletic shoes to athletic apparel and accessories not only for men and women but also for kids. Today, its product range also includes a lifestyle category, in which Adidas sneakers are a part of, to cater to a broader market. Summarized below are some information to help you understand Adidas sneakers better. Buying Adidas sneakers may be overwhelming, especially when done online since a first-hand visual inspection and actual fitting is not achievable. We put up a quick guide below to make things a bit easier for you. Like all sneakers, Adidas lifestyle kicks are categorized based on cut or collar height – low-top Adidas sneakers, mid-top Adidas sneakers, and high-top Adidas sneakers. But how does each category differ from one another? Low-Top Adidas Sneakers Adidas Sneakers. The majority of Adidas sneakers out on the market today are low-tops. These are the Adidas sneakers with collar height that fall just below the ankle. This kind of sneakers allow flexible movement in the ankle and are typically lightweight. Some Adidas sneakers with low-top construction are the NMDs, Superstar, Stan Smith, Yeezy Boost 350, Seeley, EQT Support, ZX Flux and much more. Mid-Top Adidas Sneakers Adidas Sneakers. Mid-top Adidas sneakers have collar heights that are in-between the low-tops and the high-tops. They have ample ankle support but not too restricting as the high-tops’. Some Adidas sneakers under the mid-top classification are the Raleigh 9tis Mid, Tubular Invader, Matchcourt Mid, Hoops VS Mid, and Adi-Trek among others. High-Top Adidas Sneakers . High-top Adidas sneakers have collars that cover the ankle for additional foot protection and sufficient ankle support. Some Adidas sneakers under the high-top classification are the Tubular Instinct, the Matchcourt High RX2, the Y-3 Qasa Boot, and the Yeezy 750 Boost among others. Adidas sneakers can also be categorized based on their design origin or inspiration. Presented in the table below are comparative information on this categorization to help you get a gist of the different types of Adidas sneakers. 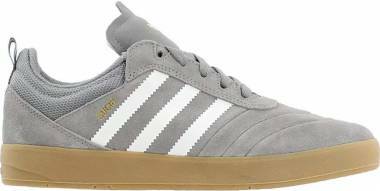 Adidas sneakers based on skate shoes are typically comprised of leather or suede upper material for increased durability that can withstand wear and tear, especially in the toe box area. They are lightweight and have sufficient overall hold and support. 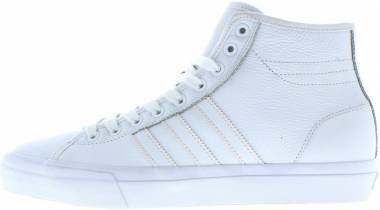 Adidas sneakers of this kind also have insoles that allow exceptional board feel, an important characteristic to consider if you intend to use your Adidas sneakers for skateboarding, too. Adidas sneakers under this category have two types of soles - the cup soles and the vulcanized soles (otherwise known as Vulc soles). Cup soles – cup soles are traditionally used in skate shoes. Adidas sneakers with this kind of sole are more durable and provide more protection to the feet. Vulc soles – Vulcanized soles are glued to the upper with a layer of foxing tape to seal it all together. Hence, Adidas sneakers with this kind of sole are lighter in weight, easier to break-in, and have a more excellent board feel. 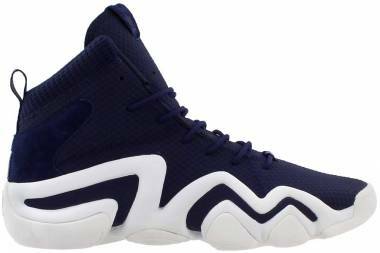 Basketball-inspired Adidas sneakers generally have excellent overall hold and support regardless of the cut or structure. Most Adidas sneakers in this category are bulky or chunky in shape with defined reinforcements all over. Upper materials vary, but leather and mesh are the most common material used for basketball-inspired Adidas sneakers. 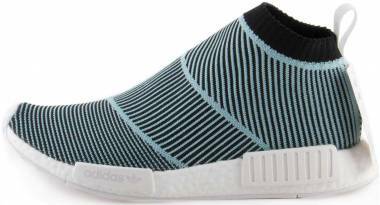 Some versions of particular models, however, utilize Primeknit upper for a sock-like fit that conforms to the wearer’s feet. Running-inspired Adidas Sneakers are typically lightweight, flexible, and breathable. Adidas sneakers that feature Primeknit upper are mostly running-inspired, but NOT all. This material provides a sock-like fit and more freedom of movement. If you intend to use your sneakers for gym, training, or light exercises, then training-inspired Adidas sneakers are your best option. Adidas sneakers under this category are usually light in weight and well-cushioned. They also feature lateral reinforcements for improved stability and added foot support. Training-inspired Adidas sneakers are also commonly designed as well-ventilated to keep the feet dry. Football-inspired Adidas sneakers are typical of leather or suede upper for durability. Since this kind of shoes is intended for casual use, spikes that are common and functional in soccer shoes are removed. Tennis-inspired Adidas sneakers can easily be identified because of their minimal design but with adequate hold and support. Finding your correct shoe size and fit can be a complicated task, especially when buying online. It gets even more difficult because the fit and sizing always vary from one footwear brand to another. On top of that, sometimes different models of the same brand also differ in fit and sizing, Adidas lifestyle kicks included, because of several factors such as the materials used, shoe construction, or the technologies utilized. As a general rule, you can always rely on valid user reviews on the Adidas sneakers you are eyeing. It would also be helpful to know your foot length and width in inches and refer to the brand’s fit and sizing guide. Adidas sneakers are available in men's and women's sizing. There are also shoe models for the young ones with sizes ranging from infant to teens. Men's sizes typically range from 5 to 13, while women's sizes are usually offered from size 4 to 11. Half sizes are also available for all shoes. Most Adidas sneakers come in standard width for both men and women, but some models are also offered in various widths. Affordable Adidas sneakers’ prices can be as low as $50 or $60, while the most expensive pairs (usually limited editions or collaborations with high-end fashion designers) are priced typically around $400. Adidas sneakers that are in collaboration with high-end fashion designers Raf Simons and Yohji Yamamoto are the most common sneaker models to fall within the range of most expensive Adidas sneakers, with prices averaging around $400. Adidas sneakers that are general releases, or those widely available across several retail shops, are commonly cheaper with prices starting at around $50. Adidas sneakers equipped with top-notch technologies like Boost or Primeknit are expectedly a little more expensive than ordinary sneakers. Over the years, Adidas has always been involved in sneaker collaboration projects with celebrities, artists, and fashion designers. Each collaboration is different from the others, which only indicates a diversity of different cultures and representations. Yohji Yamamoto is a Japanese fashion designer that is currently based in Tokyo and Paris and owns two high-end fashion lines such as the Yohji Yamamoto and the Y’s. Yamamoto's collaboration with Adidas sneakers started in 2002 and known for the fusion of sports and fashion through sneakers with state-of-the-art designs and expert craft. The collaboration’s official name is Y-3. The “Y” stands for Yohji Yamamoto, the “3” for Adidas’ Three Stripes, and the “dash symbol” in between for the bond between the two parties. Stella McCartney is a renowned and successful London-based fashion designer. Her appointment as the Creative Director of a French luxury fashion brand Chloè opened a door of opportunity for McCartney to launch her own fashion house in partnership with another big name in the industry, the Kering or then known as the Gucci group. Presently, she operates freestanding stores worldwide across US, Europe, and Asia. The Adidas sneakers and Stella McCartney collaboration started in September 2004 through the Adidas by Stella McCartney line. The collection comprised of true sports performance design for women. It covers various sports lines such as running, gym, and swimming. The Adidas by Stella McCartney line received a worldwide success that by 2006, Adidas and McCartney extended their collaboration for few more years, expanding the Adidas sneakers collection to include tennis as well. Kanye West is a recording artist, music icon, and footwear designer with several successful sneaker collaborations before his partnership with Adidas, such as those with Louis Vuitton, Bape, and of course, Nike. The Adidas and Kanye West collaboration started in 2013 after West ended his five-year partnership with the brand's primary competitor, Nike. With Adidas, Kanye West not only has full control on the sneaker designs but also receives royalties from the sales of their collaborative products. 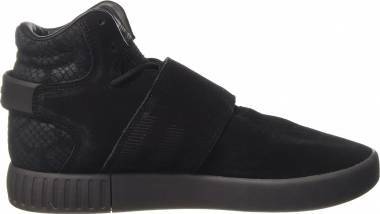 The first sneaker that Kanye West designed for Adidas was the Adidas Yeezy 750 Boost, a high top sneaker with a full suede upper, a zipper closure along the lateral side, and a Boost sole. It first released in February 2015 in a limited quantity of 9,000 pairs that sold out just in 10 minutes. To date, the Adidas Yeezy continues to be one of the highly sought sneakers in the market. Raf Simons is a well-known Belgian fashion designer. His collaboration with Adidas started way back in 2013 through five different designs of limited-edition Adidas sneakers. The Ozweego 2, Stan Smith, and Response Trail Runner are just a few of Adidas sneaker silhouettes included in the collaboration. Dennis Busenitz is one of today’s highly acclaimed professional skateboarders. He has been a part of the Adidas Skateboarding team since 2006. His first shoe with Adidas Skateboarding is the Adidas Busenitz Pro. Being involved in the design process, he took inspiration from his favorite Adidas shoe model, the soccer shoe Copa Mundial, and turned it into a modern skate shoe with a cup sole. Adidas collaboration with another renowned high-end fashion designer, Jeremy Scott, started in 2008. The collection may not have been for everyone, but it sure made a statement. Scott is best known for his winged high-top Adidas sneakers, furry Adidas sneakers with bear heads, and other bold designs for Adidas sneakers. In 2014, Adidas Originals officially announced its long-term collaboration with American rapper Pharrell Williams. The first collection called the “Solid Pack” released in September 2014 involving Stan Smiths in three monochromatic colorways (red, blue, and black). The Trefoil logo at the heel has been replaced with Pharrell's take on the Three Stripes. The collaboration is still ongoing up to this day involving several other classic Adidas silhouettes. Adidas released its first ever leather tennis shoe in 1963. Two years later, this tennis shoe was officially named after French professional tennis player Robert Haillet. When Haillet retired, Adidas looked for the next athlete to represent it and found American professional tennis player Stan Smith, who at that time, was on the top of his career. In 1971, the shoe officially renamed as the Adidas Stan Smith. The sneaker gained popularity particularly during the ‘90s that in 1994, 23.7 million pairs of the Stan Smith had been sold reportedly. In 2011, Adidas announced that it would stop production of the Stan Smith by 2012, a move that made it really difficult for sneaker fans to cop a pair as months went by. The following year, Adidas sent unique versions of the Stan Smith to several celebrities it used to work with such as A$AP Rocky, Ellen DeGeneres, and Alexander Wang as part of a promotional campaign. It was re-released in 2014, in time for the shoe's 50th anniversary, and has been one of the brand’s best-selling sneakers up to this day. The Adidas Stan Smith is recognized for its minimalist all-white leather upper accented with a green heel tab. Because of this, consumers find it a convenient and stylish pair to wear with almost any kind of outfit. The green heel tab is one of the most distinguishable features of the Stan Smith. However, it was not initially included in the original version of the shoe and only added in 1967 as an additional support feature. Unlike most Adidas sneakers, the Stan Smith lacks the typical Three Stripes branding on the sides. Instead, it features perforation details formed into three lines that resembled the Three Stripes. The perforations function to allow ventilation for the feet. Recent releases, however, come in different versions and colorways. Adidas Stan Smith. This is the original version. It features an all-white leather upper and tonal laces, a rubber outsole, and a thin tongue bearing Stan Smith’s portrait and signature. The heel part has the “Stan Smith” and Adidas Trefoil brandings. Adidas Stan Smith II. This version was released in the 2000s with distinct differences from the original. Not only is the tongue thicker, but it also lacks the Stan Smith portrait and signature. Instead, it was replaced by a more straightforward "adidas STAN SMITH" text branding. The heel part is also different as it only displays the Adidas Trefoil logo. Moreover, the inner part of this particular version is lined. Adidas Stan Smith 80s. Released in 2011, this version is the replica of the original Stan Smith but with a yellowish outsole and laces for a retro vibe. Its iconic style made the Adidas Stan Smith as one of the most photographed sneakers worn by celebrities and personalities in the fashion industry. Some of which are Phoebe Philo, Marc Jacobs, Gisele Bundchen, Kendall Jenner, Katie Holmes, Zendaya, Sienna Miller, Bella Hadid, Victoria Beckham, Julianne Moore, and Karlie Kloss. Renowned fashion designers have also designed their versions of the Stan Smith such as Raf Simons, Yohji Yamamoto, and Jeremy Scott. American rapper and singer Pharrell Williams also had the opportunity to design versions of the classic Adidas sneaker recently. The Adidas Stan Smith was the Shoe of the Year in 2014 by the Footwear News. During the early ‘60s, Horst Dassler and a team of Adidas experts had an idea to develop an entirely new concept of basketball shoes. During this time, basketball shoes were dominated by canvas materials with the likes of Pro-Keds' Royal and Converse's All-Stars. These shoes provide minimal foot support resulting in ankle and knee injuries for many players. They came up with a different shoe construction, a “shell sole” that will provide optimum grip on the court, improve stability, and is lighter in weight. In 1964, the “Supergrip” shoe was released featuring a shell toe for added durability and protection in the forefoot area. The "Supergrip" was eventually updated in 1969 and released officially as the "Adidas Superstar," with professional basketball player Kareem Abdul-Jabbar as its official endorser. The Adidas Superstar was introduced as the low-top version of the Adidas Pro Model basketball shoes. It was the first ever low-top basketball shoe and the first basketball shoe to feature an all leather upper. The Adidas Superstar has always been acknowledged for its rubber shell toe, which is the primary reason as to why it gained the nicknames "shell toe," "shell shoes," "clam toe," and "seashells." It features a herringbone-patterned rubber outsole for optimum traction. On the heel is the “SoftProtect” padding as added protection to the Achilles tendon. Today, the Adidas Superstar is available in several iterations and colorways. It has also been a subject of several collaborations with fashion designers and influential celebrities. A big part of the Adidas Superstar's rich history is the hip-hop group Run-DMC. They wore their Superstars with laces undone, and tongues pushed out everywhere they went and released a song called "My Adidas" in 1986 as a tribute to the shoe and response to the anti-sneaker attitude in pop culture. During their performance at the Madison Square Garden, they asked the audience to hold up their Adidas Superstars – a move that left an enormous impact on their fans and the hip-hop and sneaker cultures. After this event, Adidas signed Run-DMC for a $1M endorsement deal. During the ‘80s, the Adidas Superstar also became extremely popular among B-Boys. Because of its stylish look and functionality, the Superstar was also an ideal footwear choice among skaters during the ‘90s. The popularity of the Adidas Superstar even extended into video games. In 2002, the famous video game Grand Theft Auto III included the iconic sneakers in the gameplay. There is also a long list of celebrities that have been photographed wearing their pairs of the Adidas Superstar such as Kylie Jenner, Gigi Hadid, Lorde, Kendall Jenner, Dakota Fanning, Emma Roberts, Emma Stone, Kristen Stewart, Rita Ora, and Katie Holmes. The immense popularity of the Adidas Superstar is also a driving factor that made it as the best-selling sneaker in the US in 2016 in dollar sales. The Adidas Gazelle is the first Adidas training shoe to utilize suede (kangaroo velour) as upper material. It originally came in two colors – blue with white stripes (Gazelle Blau) and red with white stripes (Gazelle Rot). The Gazelle Rot had a gum rubber outsole with grooved wave pattern, while the Gazelle Blau had a microcell ripple outsole. Although released officially in 1966, the popularity of the Gazelle peaked during the ‘70s. But it was not until the ‘90s that the classic silhouette received a myriad of colorways. The Adidas Gazelle is recognized for its all suede upper with a distinguishable T toe overlay and a contrasting Three Stripes in white. During the ‘90s, the Adidas Gazelle is a popular sneaker choice of music artists and celebrities with the likes of Beastie Boys, Kate Moss, Michael Jackson, and Mick Jagger and Keith Richards of the Rolling Stones. At present, having been reintroduced under the Adidas Originals line, the Gazelle remains to be a favorite among celebrities like Rosie Huntington-Whiteley, Karlie Kloss, Kate Moss, Naomi Campbell, Gigi Hadid, Lily Aldridge, and Emma Roberts. The Adidas Samoa is a famous ‘80s trainer shoe. It was initially released in 1977 featuring a reinforced toe completed with rubber bumper and a Trefoil tread rubber outsole. Adidas Samoa. This is the Samoa version released during the Adidas All Originals campaign in 2011 along with other classic Adidas silhouettes such as the Gazelle, the Superstar, and the Campus. Adidas Samoa Vintage. The vintage version has a shorter toe box compared to original Samoa. It also utilizes pigskin suede or leather upper material and a nylon tongue. Adidas Samoa Leather. This version, as the name suggests, shadows the silhouette of the original Samoa but the upper material utilized is leather. A newly developed EVA compound in the form of a heel pad located in the midsole. The Boost is a revolutionary cushioning system introduced by Adidas initially on their running shoes. It was aimed to provide runners soft cushioning and highest energy return. Presently, the Boost technology is also used in lifestyle sneakers. The Adidas Primeknit is a modern knitting technology utilized as a one-piece upper of Adidas sneakers. It provides a supportive, sock-like fit to the wearer. The Adidas Xeno is a light responsive technology used in upper materials of Adidas sneakers. Adidas sneakers utilizing this technology initially appear in a black upper material, but when hit with light, it “illuminates” or explodes with bright colors. Like the Xeno, the Adidas Chromatech is a technology used on the upper materials of Adidas sneakers. It is a color shift technology that makes the upper material expand and contract, which results in a change in color that varies as to how the shoe is worn. This way, every shoe is unique. It is sometimes shortened to “CT” when included in an official shoe name. The Climacool is a 360-degree ventilation system placed on the upper to allow ventilation in the shoe. The Torsion System provides lightweight arch support. Founded by brothers Adolf and Rudolf Dassler in 1924 in Germany, the Adidas we all know today was originally named as the Gebrüder Dassler Schuhfabrik (Dassler Brothers Shoe Factory). The undeniable success of Adidas humbly began in the wash kitchen of the Dassler matriarch with a vision of providing the best equipment for athletes. Adolf, otherwise known as Adi, was able to convince athletes to wear his hand-made spiked running shoes at Olympic Games. Some of these athletes won gold medals wearing his work such as Lina Radke (1928, Amsterdam) and Jesse Owens (1936, Berlin). The Dassler brothers had a falling out which led to their separation and eventually the formation of their respective shoe companies. Rudolf formed Ruda (which later on rebranded as Puma), while Adi established Adidas. On August 18, 1949, Adi Dassler registered Adidas with only 47 employees. The same day, he also filed the first Adidas shoe bearing the signature Three Stripes. Adi continued working closely with athletes in providing them the best performance shoes. He listened to the athletes’ needs and professional feedback on his products to deliver what is needed in the field. All his hard work started to pay off eventually. Adidas became a household name on football pitches when the German national football team won against the unbeatable Hungarians in the 1954 World Cup final wearing the Three Stripes. It made history as it was Germany’s first ever World Cup victory. The brand eventually expanded to include apparel and first on the list was a Three Stripes tracksuit that debuted in 1967. Later on, it covered other sports as well such as gymnastics, tennis, running, and much more. Adi Dassler’s demise in 1978 did not stop Adidas’ success as his son Horst took over the company. The brand sustained its place in the industry, all the more got involved in arts and the music scene. Hip-hop group Run DMC released a song entitled "My Adidas" and held up a pair of Three Stripes during one of their concerts at the Madison Square Garden. That occurrence paved a way to their partnership with the brand, which led not only to a fusion of art and sports for Adidas, but also to the brand’s presence in street fashion, hip-hop scene, and in the non-athletic department in general. Horst Dassler’s sudden death in 1987 was the start of the downfall for Adidas. For the first time in years, the brand announced a considerable amount of record loss in 1992 that it almost went bankrupt. The then CEO Robert Louis-Dreyfus and his partner Christian Tourres came to the rescue and directed back the company to its rightful direction towards recovery. In 1997, the company changed its name to Adidas-Salomon AG after its acquisition of the Salomon Group. The following year, it relocated to a new headquarters, the "World of Sports," just outside Herzogenaurach in Germany. By the 2000s, Adidas established a lifestyle segment with a focus on sports-inspired streetwear, which later on paved the way for collaborations with renowned fashion designers, fashion labels, professional athletes, and influential celebrities. A year after Salomon parted ways with Adidas, the giant Three Stripes acquired Reebok bringing together two of the most highly acclaimed and respected brands in their industry. The company later on renamed as the Adidas AG. Adidas slowly transitioned from being exclusively a sports brand to a lifestyle performance brand as well. In 2000, it established three main divisions that categorize product range based on its target market or consumers – the Adidas Sport Performance (Adidas Forever Sport), the Adidas Sport Heritage (Adidas Originals), and the Adidas Sport Style (Adidas Equipment). Later on, the Adidas Neo was launched as an additional label under Adidas. The Adidas Sport Performance division focuses on Adidas range of footwear, apparel, and accessories for competitive sports. It is the arm of Adidas that centers on innovations and technologies. Products under this division embody the new diagonal Three Stripes logo, otherwise known as the Performance logo. Launched in 2001, the Adidas Originals is a sub-brand of Adidas that intends to showcase the brand’s heritage in sports into stylish and lifestyle-oriented products. Products under this umbrella utilize the Adidas Trefoil logo. The Adidas Originals covers the brand’s classic designs that root from the 1940s to the 1980s. To be able to address current market trends and demands, this sub-brand usually pulls out classic shoes from the Adidas Archive and applies technologies or design tweaks to create a new sneaker while still staying true its roots. In 2001, the first Originals store opened in Berlin, Germany and later on in Tokyo, Japan. Adidas Originals’ previous campaigns were “Impossible is Nothing” (2004), “All In” (2011), and “Original is never finished” (2017). The “Impossible is Nothing” campaign involved highly acclaimed athletes such as David Beckham, Mohammed Ali, Tracy McGrady, and Jona Lomu. The Adidas Sport Style division focuses on fusing sportswear and fashion in Adidas products. It aims to instigate the future in sportswear. It was established in 2002 with Japanese fashion designer Yohji Yamamoto as its Creative Director. Under this division are several collaboration projects with fashion designers such as Yohji Yamamoto and Stella McCartney. The Adidas NEO launched in 2008 as another sub-brand of Adidas. It specializes in casual footwear and apparel that links sports fashion with the current fashion trends with the youth or teenagers as its target market. Since its target market is the youth with limited spending capability, it aims to provide products like Adidas sneakers at a much lower price point compared to regular Adidas products. The Adidas NEO sub-brand signed Justin Bieber and Selena Gomez as its brand ambassadors. In the sneaker market, Adidas is one of the giant brands, but it is also a known fact that its biggest competitor, Nike, has always been at the top spot. However, 2017 so far is what we can safely call as a booming year for Adidas. Although Nike still retains the top position, data reflect that Nike’s market share as of May 2017 dropped from last year’s and so as that of the Jordan Brand’s, which is also a Nike-owned brand. Throughout the years, Adidas has filed cases against several brands and retailers for its Three Stripes copyright issues. Some of these cases were against Aldo Group Inc. (2009), Abercrombie & Fitch (2005), and Puma (2017). In 2008, Adidas won a $350 million lawsuit against Payless ShoeSource for copyright infringement on its Three Stripes logo. The dispute lasted for six and a half years. 1. What are the common materials used in Adidas sneakers and other products? Adidas sneakers vary in materials. Specific product information is provided in the product labels as well as in the online product information page through the brand’s official website. However, Adidas, as a brand, is committed to the use of recycled or sustainable materials on Adidas sneakers and other products to address environmental concerns and improve its environmental footprint. The most common sustainable materials used are recycled polyesters (PES) from plastic bottles and used garments, recycled polystyrene from used food packaging, recycled rubber, organic cotton, Tencel (a fiber made from wood pulp), and non-mulesed wool for apparel and leather. Adidas is also one of the first global consumer goods companies to eliminate PVC from its products. Most of its products are PVC-free except for some athletic footwear products that are produced in a few countries without available alternatives yet to such material. Adidas is also committed to eliminating volatile organic compounds within their products. 2. How do I know if my Adidas sneakers are not fake? Buying products from official Adidas online site and official retail shops guarantee authentic products. If you opt to get a pair from online sellers or other suppliers, you could check the quality and craftsmanship of the Adidas sneakers you are eyeing to buy. Typically, fake products are poorly made. They have some or all of the following characteristics: shoddy stitching details, incorrect or inaccurate logo, wrong spelling, absurdly cheap price, same serial numbers for the left and the right shoes, and poor packaging. 3. What is Adidas Boost made of? The Boost is one of today’s Adidas’ top-of-the-line technologies evident in a wide range of footwear products including Adidas sneakers. It is a cushioning technology developed by German chemical company BASF (Badische Anilin & Soda-Fabrik) and licensed to Adidas. The Boost is comprised of hundreds of nuggets of thermoplastic polyurethane (TPU) tightly packed together that not only compress upon impact for shock absorption, but also instantly bounce back to their original shape resulting to a high energy return. 4. What does Adidas NMD stand for? 5. How much do Adidas sneakers usually cost? The price of Adidas sneakers varies depending on the materials used, technologies utilized, type of release, and other factors. 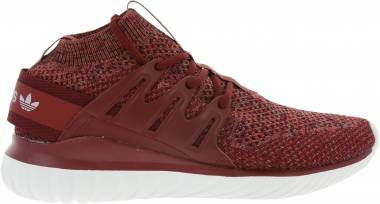 Typically, affordable Adidas sneakers range around $50 or below $100. These are usually the general releases or those released in huge quantities across official Adidas stores, website, and third-party retailers. On the other hand, limited releases, designer items, and Adidas sneakers with top-notch technologies are priced around $200 up to $400. 6. Why are the Adidas Yeezy shoes expensive? 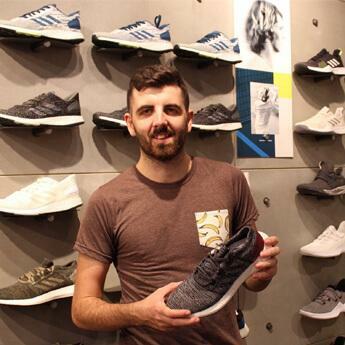 According to Jonathan Wexler, Adidas' Global Director of Entertainment and Influencer Marketing, during his March 2016 interview with New York radio show Power 105.1's The Breakfast Club, Adidas Yeezy sneakers are released in limited quantities mainly because they utilize Adidas' latest technologies such as the Boost and the Primeknit. Because these technologies are complex, production of Yeezy sneakers is limited, which results in limited supply and eventually higher retail price. Also a factor is that these shoes are designed and endorsed by Kanye West. 7. Do Adidas sneakers run true to size? Generally, Adidas sneakers fit true to size. However, it still varies depending on the construction, shape, or overall profile of the shoe. Here at RunRepeat, we provide fit and sizing information for each shoe model as your guide in choosing the right Adidas sneakers size for you. 8. I wanted to get a pair of Adidas sneakers, but it is only available in men’s sizing and I am a female. What size should I get? Women’s sizes are typically 1 to 2 size bigger than men’s. So, if you are a size 7 in women’s sizing, you should get a size 5 to 6 Adidas sneakers in men’s sizing. Again, you may refer to the “Fit and Sizing” section of the specific Adidas sneakers you are eyeing here at RunRepeat for more information. 9. What is the meaning of the brand name Adidas? There is a popular myth that Adidas is an acronym for “All Day I Dream About Sports” or “All Day I Dream About Soccer,” but the name is in fact derived from the brand’s founder’s name, Adi Dassler. Adi Dassler originally wanted “Addas” as his company’s name. However, upon registration, he learned that there was already a children's shoe brand named as such, so he used "Adidas" instead. 10. What are Adidas’ trademarks and official logos? Adidas has always been recognized for its Three Stripes trademark visible on all kinds of its products from Adidas sneakers and other footwear, apparel, sports equipment, and accessories. Because of this, it is often referred to as the Three Stripes brand. Of course, there is also the Performance Logo that can be seen in all Adidas products of today except those under the Adidas Originals line. There is also the iconic Trefoil logo that presently used in all Adidas heritage products under Adidas Originals. Although most may think that the Three Stripes in Adidas sneakers are there for aesthetic purposes, they were originally intended for stability. The Trefoil is one of Adidas’ official logos, which the brand has been using since 1972. It was launched just in time when the Olympic Games opened in Munich, Germany. The Trefoil logo is comprised of three leaves fused together in a flower-like figure with a distinguishable Three Stripes mark on its bottom half part. It symbolizes "performance," as well as the Olympic spirit and Adidas’ heritage and origin. It was utilized in all Adidas products until in 1997 when it was replaced by the Performance logo. Since then, the use of the Trefoil logo has been limited only to the brand’s heritage products under the Adidas Originals line. The Performance logo originally appeared on the Adidas Equipment line launched in 1991. 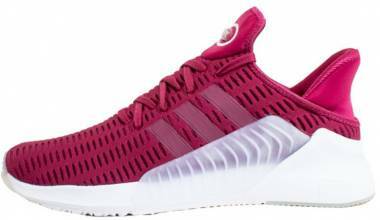 Designed by footwear designer and then Creative Director Peter Moore, it resembles the brand’s signature Three Stripes in a mountain-like form that symbolizes the challenges that every athlete encounters. In 1997, Adidas adopted the Performance Logo as its official logo after deciding that the Trefoil logo would only be used for its heritage products. 11. Where is the Adidas headquarters located? Adidas headquarters, called the "World of Sports," is located in a small town of Herzogenaurach in Bavaria, Germany. 12. Where are Adidas products produced? Adidas products, including Adidas sneakers, are manufactured in not less than 60 countries around the world. It outsources most of its production to more than 1,000 independent factories globally across Africa, Australia, New Zealand, Europe, and America. Most of its factories are located in Asia, with about 27% of all (or 337 factories) are in China. 13. What other brands does Adidas own? Under the Adidas Group are Adidas, Reebok, TaylorMade Golf, Adams Golf, Ashworth and CCM Hockey. 14. What is the Adidas slogan? Adidas started using the slogan “Impossible is Nothing” in 1974, which was actually based on one of Muhammad Ali’s quotes. The American boxing legend used to endorse the brand during the peak of his career, hence the reference. It was not until 2011 that Adidas changed its slogan to “All In”. Then in 2013, Adidas adopted the “Adidas is All In” as its new slogan and global marketing strategy. It aims to fuse all the sub-brands and labels under Adidas and give out a unified image to consumers with different interests such as sports, fashion, pop culture, and music.